My current imaging setup had two deficiencies; short focal length for galaxy season and non-cooled camera for hot nights. The short focal length deficiency has a compromising, but effective remedy. Astro-physics updated their Barlow to the Advanced Barlow which is more corrected for photography with APS C sensors. The 2x Barlow provides a flat field across 80% of the sensor. The non-cooled camera was solved by the new ZWO ASI294 MC Pro. A cooled CMOS sensor in a 4/3 format which matches well with my Canon T5i. one shot color. I don’t want to mess with multi-filter images. ability to control via WiFi on iOS device via ASI Air. First test of this setup was last last week with excellent results. I was able to achieve a nice image scale on M51 that I believe is better than simply enlarging a shorter focal length image. And I LOVE utilizing the iPad for image control of the camera!!!!! Increasing my imaging time was a top priority this winter. So, many experiments have been conducted with narrow band and light pollution filters from my backyard. It has been many years since my days of narrow band imaging with an SBIG ST10 and Halpha filter. From the zenith to the south I have fairly decent skies. The further north of the zenith the lights from Huntington start to be a problem. I know that a modified DSLR is not very efficient for narrow band imaging, but it is what I have decided to use for multiple reasons and so, it is what I have. I think with enough data and drizzle techniques, the camera is quite capable of doing narrow band imaging. Data acquired 10/18/2018 and 12/17/2018. Please check out the John Glenn Astronomy park the weekend of May3-5. Two observing events are planned. Links below. May the 4th be with you. Anxiety runs high when testing new glass and astrophotography configurations. I received the new AP Stowaway in December and have been assembling required accessories for astrophotography until about 2 weeks ago when the final piece arrived, the Canon camera adapter. As always, Astro-Physics pieces are exquisite in design and function. I needed some time to figure out the proper combination of plates and screws needed to transition my imaging system from an AP 130 Gran Turismo/Baader Vario-Finder quick release bracket/SG-4 guider to the 92mm Stowaway and autoguider setup. Below, you see the fully assembled imaging setup. (I did eventually change the ring orientation so the ring screws were attaching from the top set of rings). Two Astro-Physics mounting plates which I can’t remember model numbers! First impressions…an incredibly rigid and easily transportable setup for powerful astroimaging. Being a mobile imager, it is important to have a setup that can be erected and disassembled in an efficient manner and likely all in a 24 hour period. My back really appreciates a compact and lighter setup, too. The imaging system rides atop the Astro-Physics Mach1 GTO. I can carry the entire imaging scope and autoguider scope in one piece and place atop the Mach 1 with no trouble. The imaging system is now ready for the summer Milky Way season and star parties. Send me an email if you have any questions about mobile imaging. On March 23 I had a slim window of opportunity between clouds and before moonrise to capture some first light. The winter Milky Way is quickly descending into the west and my setup is really oriented toward Milky Way photography. So, I had a brief target window for the Rosette Nebula as it was post-meridian by end of astronomical twilight. 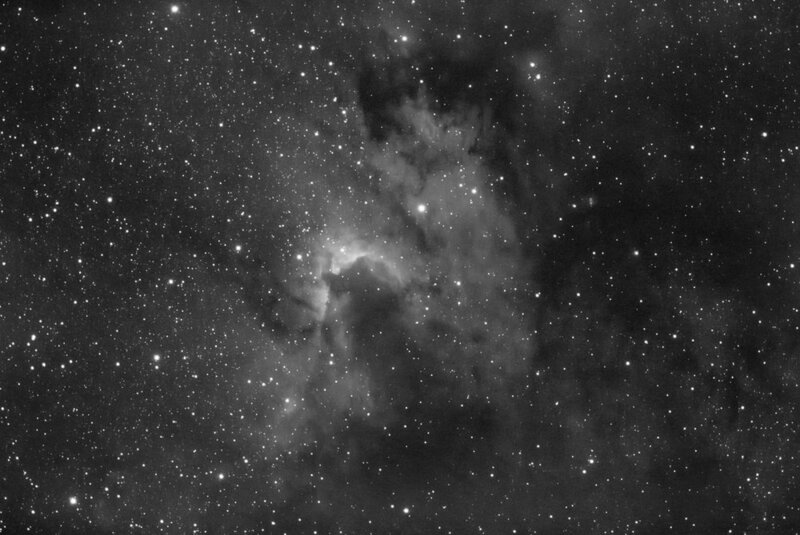 I was hoping for a full two hours on the Rosette, but only recorded 80 minutes due to increasing high clouds. The image below is a slightly cropped version of the Rosette nebula from the evening. I have really grown to like the dual band Ha/OIII STC filter from my light polluted neighborhood. The single frames of 20 minutes at ISO 1600 have very nice signal to noise on chilly evenings. The image was processed with Light Room, Pixinsight, and Photoshop. I, also, just received a new imaging instrument from Astro-Physics! Hoping it is up and running by late winter/early spring. So, a lot is going on behind the scenes. Hoping my Cave nebula comes together in the next few weeks. The imaging window for that object is coming to an end for the year. I have data on M78/Barnard’s loop as well as Cone Nebula. The DATA collection and image processing on these objects will go into late winter for sure. Hope all is well with you and clear skies. Join me on photography journeys from desert landscapes to deep sky wonders.